As spring approaches, we are ever more alert for signs of changes. Most are subtle– the browning and fall of mahogany leaves, replaced within a week by soft new green growth; gradual decrease in the water levels of lakes and wetlands; disappearance of the kingfishers. Others are more dramatic, such as huge flights of Tree Swallows and gatherings of Yellow-rumped Warblers. Warbler flocks must be scrutinized, but so far we see only “Myrtles,” Palm Warblers and an occasional Prairie, Black-and-white or Orange-crowned Warbler. We listen for the early migrants, notably the Louisiana Waterthrush. We cannot help but see new signs of human disturbance. 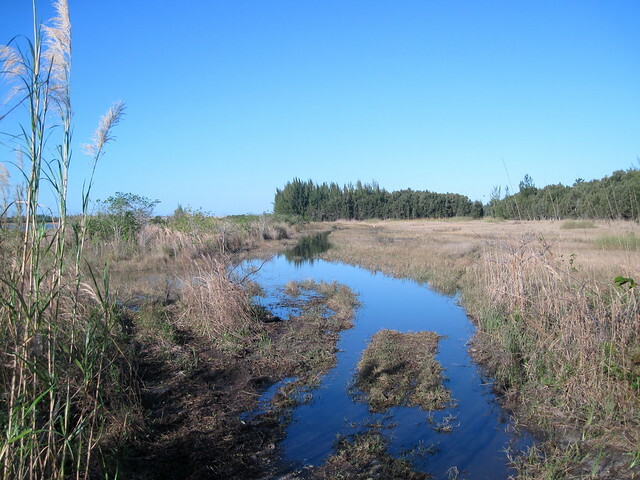 Our birding “patch” consists of Everglades wetlands habitat that had originally been “reclaimed” by draining, and converted to pastures. By the end of the 20th Century, residential development pushed westward some 20 miles from the Atlantic coast to the edge of the Everglades preserve. The land was then set aside as a water conservation preserve by developers of our subdivisions to mitigate the environmental disturbance they created. Ditches were blocked and low levees were put up around it. Exotic trees such as Melaleuca, Australian Pine and Brazilian Pepper were removed, but there has been no maintenance of this effort since about 2005, so it is already overrun by these invasive plants. Since it is separated from the Everglades preserve by high levees and US-27, its hydroperiod (the average number of days each year that it is covered by water during the summer through fall wet season) only weakly resembles that of the historic Everglades. There is no sheet flow as in the “River of Grass,” and the water level is dependent upon rainfall and local storm water discharge. Although January was almost completely dry, there was unusually heavy rainfall during the past month. The prairie around the largest lake would normally be drying up by early March. Water would be more confined to ditches and sinkholes, concentrating aquatic prey and providing a rich food source for long-legged wading birds. Because of the higher water levels, these birds are still dispersed in the wetlands. By this time of year, this trail across the prairie would normally be muddy but not under water. Now it is even too wet to be used by off-road vehicles which created the deep ruts in past years. Although we rarely meet other people on our early morning walks, the area is fairly accessible to dog walkers, bicyclists and off-road vehicles. Young people especially like to drive their all-terrain vehicles (ATVs) into the wetlands and just have fun getting covered in mud. Some are more destructive. This past weekend they cut a path clear through the formerly dark and quiet little grove of Trema trees that I call the “Fake Hammock.” This is the only dry woodland near the entire four square miles of the preserve. 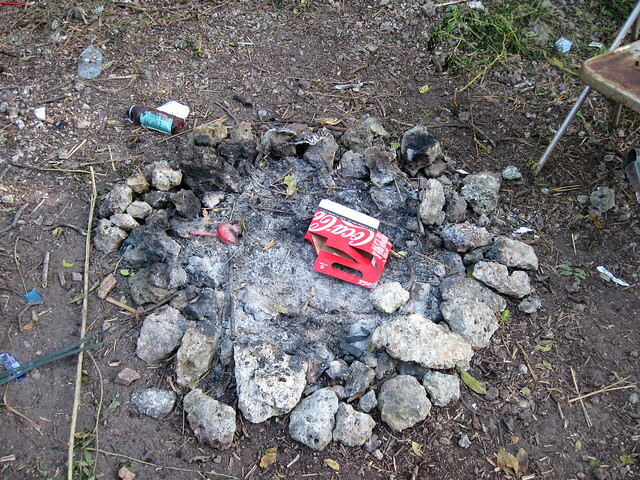 They constructed a fire ring and started a pretty hot fire that charred the green leaves above and opened the canopy where I liked to sit and wait for the warblers to arrive. (See: “Birding in a make-believe hammock.”) We hesitate to complain to authorities, as their “solution” to the problem may simply be to clear away all the trees. It’s not all bad. A couple of years ago, by running in tight circles (”donuts”) the RV cowboys dug a fairly deep hole in one low spot. It remained wet almost the entire year. This artificial “alligator hole” attracted Swamp Sparrows, Marsh Wrens and this Northern Waterthrush, among the first birds I photographed after I got my telephoto lens in 2008. Our local preserve faces much more sweeping changes in the years ahead. The mile-long stretch of gravel road by which we access the eastern part of the area is slated to be paved and turned into a four-lane boulevard. Since it will form a much-needed link between I-75 and US-27, we can expect it to carry very heavy traffic. Only the economic downturn has stalled the completion of the roadway. 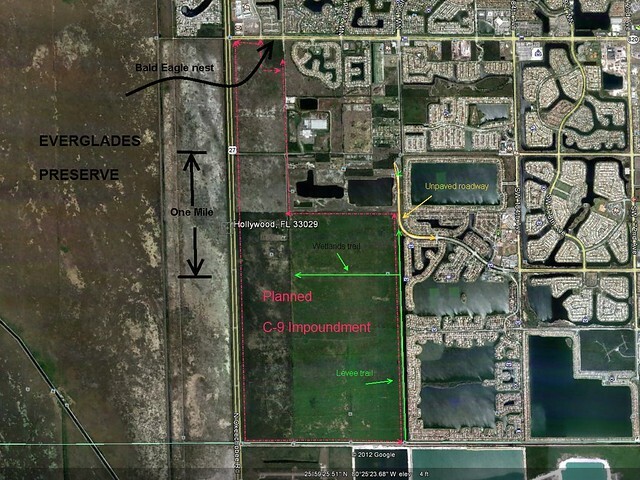 Further, within the next ten years, the entire area will be surrounded by high levees and turned into a huge reservoir, to be called the “C-9 Impoundment.” The upland areas will be inundated by 4 to 6 feet of water. 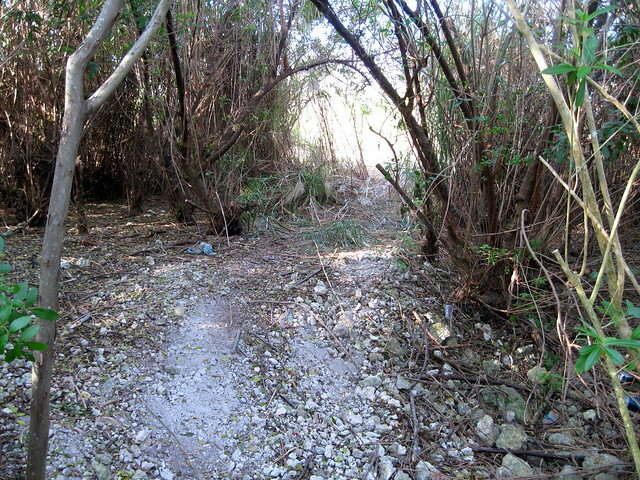 The destruction of this habitat is for a good cause, as it will limit seepage of storm water from the Everglades and help restore sheet flow. Terrestrial species such as Raccoons, Gray Foxes and Bobcats will pay the price. Early one morning I came across this traveler on the roadway, who was not happy when he saw me approaching. He hissed loudly “Oh, Shhhhhhhhh-t” (Alright, I didn’t hear the first word, but I knew he meant it). 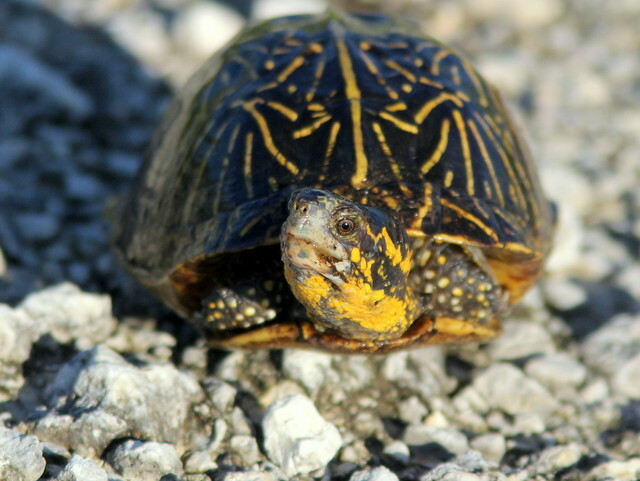 Of course I carried this Florida Box Turtle safely to the grassy roadside. He disappeared quickly into the dense grass. Last spring, after I left for Illinois, my neighbor Scott discovered a rookery across the 196th Avenue Canal, at the far northern end of our patch. 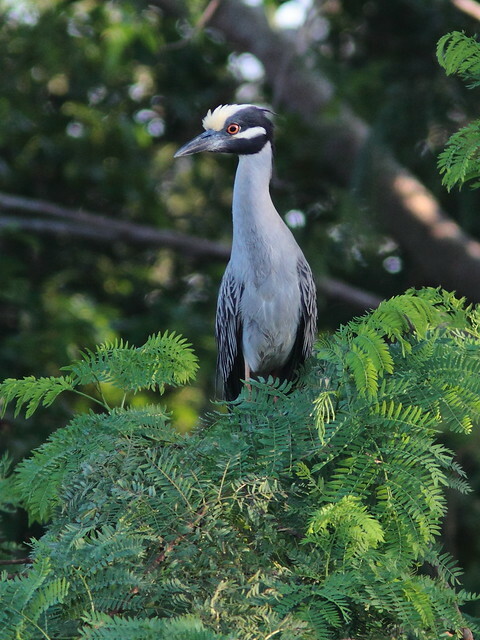 He counted about 5 nests of Yellow-crowned Night-Herons as well as one belonging to a Green Heron and another to an Anhinga. Most of the nests were rather low, on branches that extended over the water. Since then, someone built a small fishing platform right next to one of the nest sites. 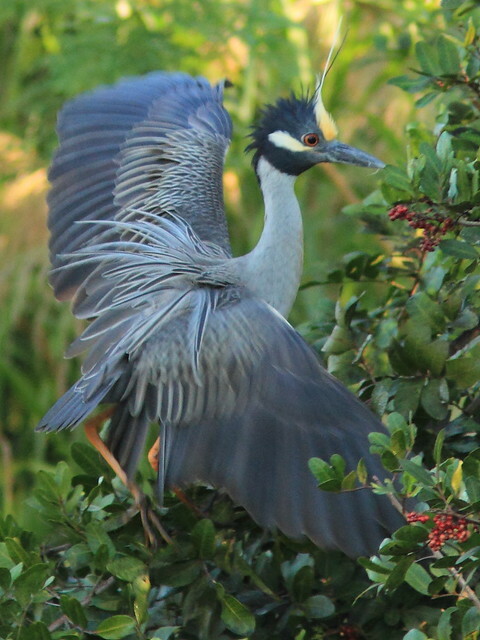 Yellow-crowned Night-Herons were one of my “nemesis birds” when I birded in New Jersey during the 1940s and ’50s. At that time they were very uncommon summer visitors to coastal areas. My inland home town of Rutherford held the distinction of being the first place in New Jersey where this species was identified, albeit belatedly. The Bronx Zoo collected several immature herons there in the early 1900s and one of them, upon attaining adult plumage, was identified as a Yellow-crown. Try as I did, I never saw one anywhere in the state, though they now nest in a few isolated colonies along New Jersey’s southern Atlantic coast. 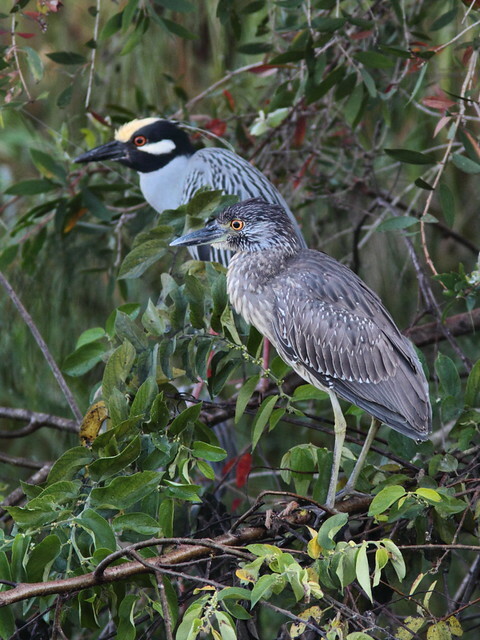 This past week I visited and found that at least four adult and one sub-adult Yellow-crowned Night Heron were roosting there. As I slowly approached the bank opposite the herons, one looked straight at me and ruffled out its plumes. At the same time it squacked abruptly. I thought it might have been a threat display. I had never seen this before. Luckily my camera was ready to catch another display sequence. Maybe it was more of a mating display, but why was one directed at me? The two herons displayed to each other. Their crowns were indeed yellow– they usually look white. Another watched from the top of a small tree. 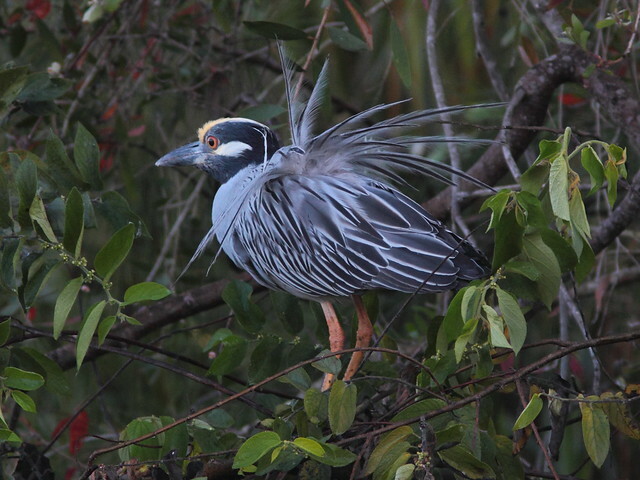 Until this week, this is how I thought Yellow-crowned Night-Herons always looked! The bird in immature plumage posed nicely next to an adult. 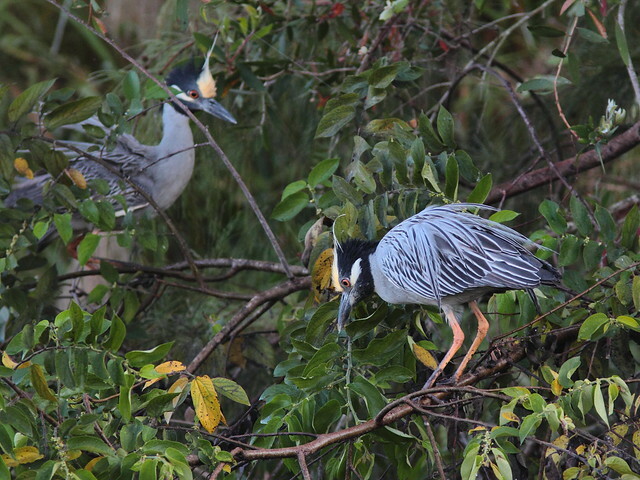 Note the thick, short bill that helps distinguish the Yellow-crowned from the Black-crowned Night Heron. I took so many photos that it was difficult to find a favorite. Although this one was in soft focus, I particularly liked the action. 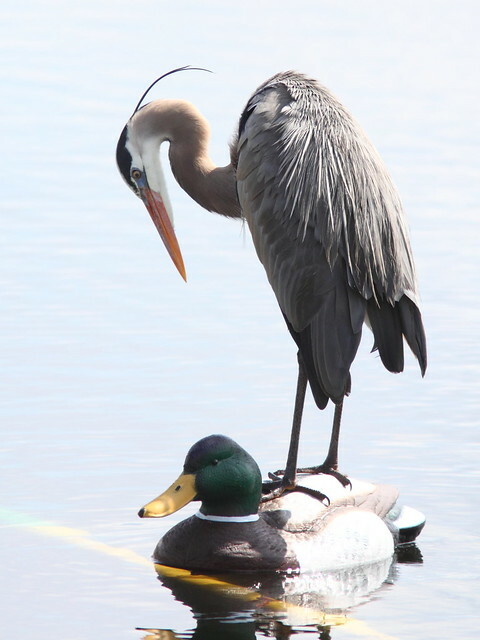 As a follow-up to my last post, about my new “Yard Bird” which cost me a small fortune, the poor thing had to put up with the indignity of having a Great Blue Heron use him as a fishing platform! 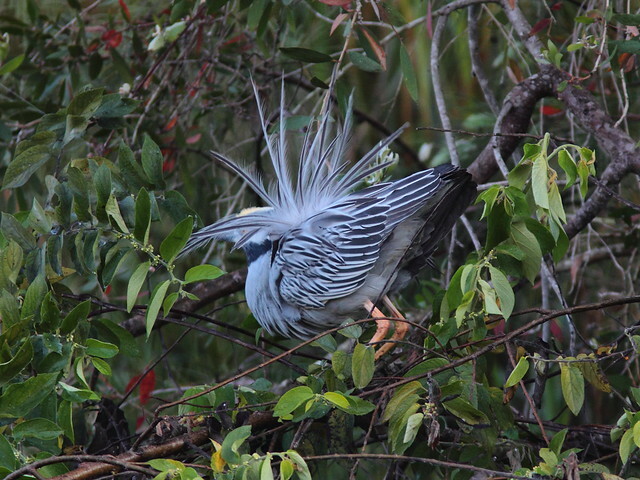 March 4th, 2012 at 11:14 am Another terrific post– I’ve been wondering about those yellow Crowned Night Herons you told me about a while back. I glad to see they are continuing to roost and nest there. In my area I been seeing Cedar Waxwings and yesterday I was fortunate enough to see a Black-throated Green Warbler. March 4th, 2012 at 5:41 pm Ken, Another wonderful post with great birds. 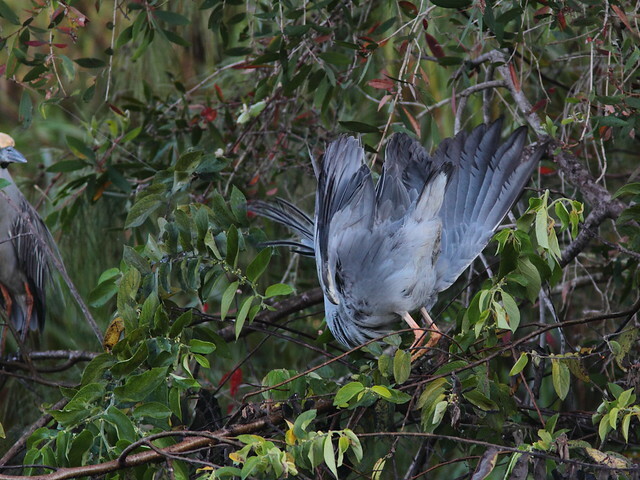 It is very cool to be able to visit the YC Night Heron rookery. They are beautiful birds. Your photos are always amazing. Well done! March 7th, 2012 at 1:17 am Boy, that is a new one for giving someone a leg up. Love the heron display, the first one is like a Christmas star and the soft focus one emphasises the shivery movement of the displaying wings. I’m sorry the habitat will go though, birds can more easily relocate than animals. March 7th, 2012 at 7:06 am That last shot is a hoot!! Boom & Gary of The Vermilon River, Canada. March 7th, 2012 at 11:41 am I always enjoy your posts so! The photos of the YC Night Heron are fantastic in their display mode. I like the turtle shot too. He should be thankful you rescued him from the roadway. March 7th, 2012 at 6:07 pm Oh mY those are all stunning images of your Night Heron…delightful! March 7th, 2012 at 9:26 pm Man, that full on head shot of the Night heron, right after the Box turtle is impressive. You continue to amaze, keep it up buddy! March 8th, 2012 at 2:32 pm Your Night Heron shots are fantastic, Ken! Excellent work! 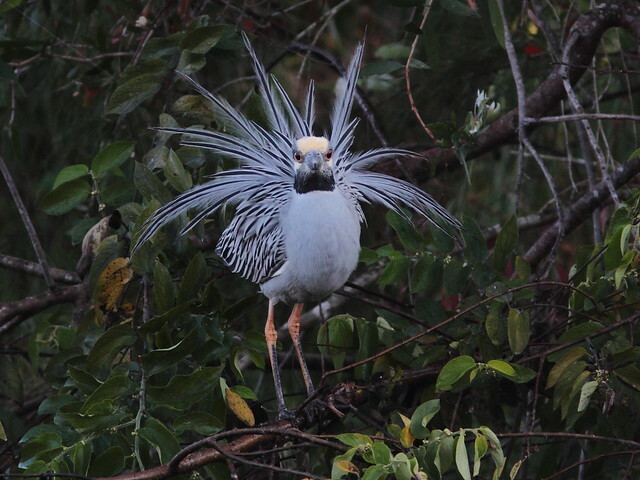 March 8th, 2012 at 3:44 pm Gorgeous shots of the Yellow-crowned Night-Herons Ken! That first display shot is perfect! I can’t believe that they allow ATVs in a preserve! What’s up with that? March 12th, 2012 at 1:09 pm Thank you, all– it was really exciting to see those herons display, something I had never seen before. @Larry– I should have clarified that the rookery itself is across the canal from land that is owned by Florida Power & Light Company. It is the site of an unmanned substation, actually on the east side of the road. The preserve is on the west side of the road. In any event, the ATVs make use of all the land, whether on or out of the preserve. While it is open to foot traffic, motorized vehicles (as well as hunting, firearms and open fires) are prohibited on the preserve, but the kids (many are more properly called young adults and even a few parents) simply ignore, deface and even remove the signs. The “preserve” is really a water conservation area, not strictly a wildlife preserve.